A 26 mile marathon in anyone's world is a long way with cobbles, uneven surfaces, steps and thousands of people in your way. However I'm not talking about the recent London Marathon but our ‘adventures' at NAB 2016 in Las Vegas. If you haven't been to the show then you have divide it basically in to 4 halls. South Upper, South Lower, Central and North. Navigation is relatively easy and although the stand numbers sometimes make no sense at all you can get around the halls in around a day each - perfect for a four day show. Aside from editorial meetings and the all important networking one of our tasks at NAB is video interviews with exhibitors giving them the chance to spread the word far further than to just those 100,000 people visiting the show. It is also a great test bed for us to try out new kit and after 26 miles this does have somewhat of a ‘shake down' effect on anything on the rig so everything is tested to the max! With over 1200 videos online now and filming interviews since 2011 we have many experiences from shipping kit, filming and editing so here goes with our review of the NAB 2016 kit used. We used the Miller 480 studio dolly with the Arrow 40 (1690) system. This comprises of a rugged Sprinter II CF carbon fibre tripod with the Arrow 40 fluid head. Max height is over 1.6 metres which although we didn't need the full extension does allow for different interview scenarios. The 100mm bowl gives a secure mount with little or no movement when pushed over uneven surfaces. We found in previous years a 75mm bowl with a mid weight camera and heavy accessories (v-mounts, light etc) did tend to lead to having to adjust the level often. The head has a back light, 7 pan and tilt positions and a 4 position rear-mount counter balance plus spirit level when you do need to check everything is straight. With no dolly then you're looking at 8kgs in weight and if, like us, you're shipping your kit around then every kg counts! The only problem we encountered during the 26 mile trek was one extended leg slipped slightly as we were pushing it along - this was easily rectified by simply tightening up the Allen screw to increase the pressure on that leg catch. Bottom line: Smooth and easy to operate, rugged and reliable. Second year we've used this combination and it just works so well over all surfaces. The new Panasonic DVX-200 camera is worthy of a review of it's own of course and there are many online so for the purpose of this overall review we'll focus on the feautures we used and appreciated. So it's a 4k camera. We have to upload files to the UK each day in order to get the interviews edited and uploaded to YouTube within 24 hours. That's just not going to happen in 4k with the access we had to broadband so we recorded in 1080p 50mps. Each interview, together with cut-aways, averages around 1Gb with around 25Gb a day being recorded and with internet upload around the 10Mbps mark you're looking at about 6 hours of upload each day (still plenty of time with a good editor to get them turned around and uploaded within our 24 hour target). The camera uses two standard SD cards so slotting in 2 x 32Gb cards was perfect for a days recording. We chose to set the camera to Relay Record which fills slot 1 and then rolls seamlessly over to slot 2. You have the option, which arguably we could have used, of Simultaneous Recording which records the same content to both SD cards for security, however we had another backup solution which we will cover later (PIX-E5). The 4/3” sensor and fixed lens gave superb results and in the interview situation, with good lighting, the Bokeh effects lift the overall production quality. The viewfinder slides easily in and out with the normal peaking, zebra and focus assist controls you'd expect - all of which we used to some extent but as we were also testing the PIX-E5 the VF was mostly slid away. The user buttons on the side are easy to configure with multiple options, in general the menu itself is intuitive and straight forward to navigate. We have very little time for setting up the interview (15 minutes allocated to each one including walking time!) so little things are crucial to us to make the difference and having easy access to audio controls and white balance plus the manual zoom enabling us to crash in and focus and pull out again sped things up. When you've got your interviewee for only 60 seconds before he is dragged to another press conference then you have to work quickly! A small issue was iris control where in some situations it seemed to have a lag where you stop turning it but it carried on past your desired level. Pretty minor, easy to rectify but worthy of mention and no doubt fixed in a software update. For camera power, although we had D-Tap available, we used the IDX SL-VBD96 internal battery with its 9600mAh/ 70Wh capacity, using only one full and half another battery per day. In our past experience this is more efficient then using the D-Tap power which is also powering the lights and on board field recorder. Bottom line: There is so much more to say about the DVX-200 but for now our results speak for themselves and together with fast and easy operation and great picture it more than did the job! We've covered the camera power but we also had other needs such as our on-camera light and field recorder to power. Both these have their own battery slots but it's far easier in recharging management to just stick a juicy V-mount on the back and take the D-tap outputs to feed them. We've been using IDX for a few shows now and in particular the Endura Cue 91Wh IDX do offer a range of batteries with piggy back capability so when you're getting low mid interview you just slot another one on and this would have been nice but that said the battery level lights are accurate and with careful planning it wasn't an issue getting through no more than two batteries per day. The charger fan made hotel bedroom charging a consideration but in my case it was competing with the fridge, aircon, service lift and the couple next door so a bit of extra fan noise was no real problem! Bottom line: Not once did we run out of power and only having to carry around 2 Vmount batteries is better than having to carry 4. There is also a new charger available now which is fan less so worth a look if you are planning on hotel room recharging as many of us have to do after a days shooting. For many shows we have used, and been pleased with, the Minima 300 light and had to tear ourselves away from it this time to try something new! Enter the Dedo Ledzilla bi-colour LED. These are simply wonderful lights. They can dim, have spot to flood control, adjustable colour temperature and power with either a NP-F battery or D-tap. As a note although we used D-tap we did test battery life when using a NP-F battery and it was literally hours - in fact a full day of interviews for us with still no signs of needing a recharge! The lights have barn doors that also swivel should you want any backdrop lighting effects or more control in general. Bottom line; great quality of light and highly flexible. 26 miles on the front of the camera show mount and still secure. I love these lights. 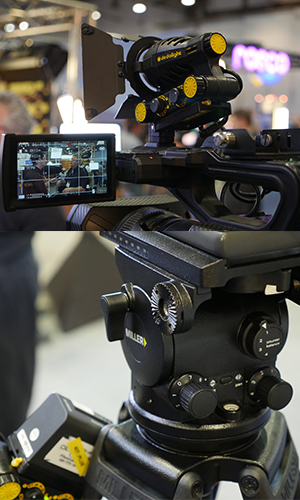 We're lucky enough to get to try some great new kit and this time we fitted the Video Devices PIX-E5 to the rig. This is the SDI and HDMI version so good for recording either 4k via the HDMI or 1080p via the SDI in our case with power coming from the IDX via D-tap and a useful voltage level (in actual volts) being shown on the display. The PIX-E5 records to a ‘speed drive' so called as it has a USB connector attached and you can simply insert into your Mac or laptop and start editing. We were using 128Gb solid state ‘speed drives' and only once after we had been recording a 4k panel show did we need to switch drives. As soon as I did this I became aware that I needed to be careful I didn't damage the USB connector as it doesn't withdraw into the ‘speed drive', nor does it have a cover - just a minor worry that is outweighed by not needing a caddy and the ease of use. The picture quality on the 5” screen is excellent with touch screen as well as ‘proper' buttons. Boot up time from power on is around 20 seconds and there are lots of functions built in aside the expected peaking and zebras. The one touch zoom is nice although we didn't really use it with this particular camera. Bottom line: For fast turnaround and a plethora of record formats then the PIX-E5 was great to use and performed faultlessly with a solid build giving that added reassurance you want. We always carry a wired hand mic with us ‘just in case' but prefer using wireless where possible simply to give more options of where the camera can be placed for the interview and reducing trip hazards and lawsuits. The Sennheiser AVX system once again solved the problem with its automatic frequency hunting and ability to retune in 13ms to another frequency. It really does just work, audio simplicity which is what we need. Bottom line: With lighting and framing you can be artistic but with audio you just want good audio, have a listen to the results and decide for yourself!